Arcimoto FUV: A Threat to PTVs? The electric powered Arcimoto FUV (Fun Utility Vehicle) is just coming to market. Oregon based Arcimoto is beginning to roll out their three-wheeled Fun Utility Vehicle (FUV). The combination of price point, size, electric powertrain and ability to travel public roads makes the Arcimoto FUV an intriguing alternative to golf cars, PTVs and LSVs. Update – Arcimoto responded to a number of questions I sent them and I have added the information to the relevant sections below. The first 10 FUV prototypes hit the road this past June. The company completed another 15 vehicles, referred to as their beta series, in September. These went to five customers and the remainder to rental locations. 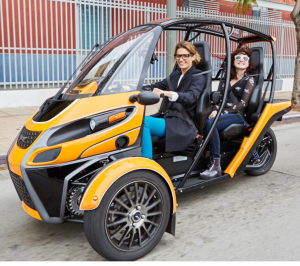 Vehicle rental franchising in tourist locations is a key part of Arcimoto’s marketing plan. As of the end of June the company has 2,800 reservations for the FUV. Management expects to begin production and delivery of their A series of vehicles during this quarter. The A series marks the move to higher volume production. Plans call for a run rate of 200 vehicles/week or roughly 10,000/year by the end of 2019. The company has deliberately designed smaller sized production facilities that can produce approximately 10,000 vehicles per year. A production facility costs approximately $10 million. This limits initial capital costs and creates a facility that can be profitable relatively quickly. Furthermore, the facility can be easily replicated in other parts of the country or the world. The Arcimoto FUV is a three-wheeled vehicle powered by a 67 hp electric motor and a 12 or 20 kWh lithium-ion battery for a range of 70 or 130 miles and a top speed of 80 mph. As a three-wheeler, most states classify the FUV as a motorcycle or similar vehicle. Therefore, it does need the same safety requirements as a full-sized, highway capable vehicle. The FUV can seat two passengers, one behind the other, and features regenerative braking, hydraulic brakes, a windshield with wiper and defrost, and heated seats and hand grips. Additional options include full HVAC, soft or hard shell doors, rear cargo box, bluetooth speakers and racks for golf clubs, bikes, surfboards, etc. The target price for the base model is $11,900 with a fully decked out model reaching the $19,000 range. The FUV is a versatile vehicle for gated communities. The vehicle can move from golf course, to community pathways to public roads. On public roads the FUV faces none of the restrictions of a golf car, PTV or LSV since it is classified as a motorcycle. Therefore, it can travel on higher speed roads and at night. The FUV can travel faster and farther as well. In terms of speed, the FUV may need a speed limiter option for use on golf courses or within communities depending on local regulations. According to Arcimoto, the vehicle does have the capability to cap speeds to meet specific needs. The company is targeting a $12,000 base price. Therefore, the FUV is pricier but competitive with LSVs and fancier PTVs given the trade off between price and functionality. One of the reasons LSV sales never really took off in gated communities as expected is that the additional price premium did not offer a significant benefit over new or refurbished golf cars. LSVs are most successful where regulations greatly restrict the use of PTVs or golf cars on local roads. However, if anything, municipalities are becoming less restrictive regarding golf car use. Furthermore, in states like California, Massachusetts, Maryland, Arizona, and Illinois there are tax incentives available for the FUV. There is also the possibility that electric motorcycle or similar incentives could be brought back at the federal level. The company is lobbying to have the tax credits for motorcycles and three-wheeled vehicles brought back. This additional cost reduction could further boost the attractiveness of this alternative vehicle. There are some potential drawbacks to the Arcimoto FUV in the gated community setting. Some communities may object to the vehicle’s higher speed capabilities. Some type of speed limiter could address this, or not, depending on the locality. In addition, given the older demographic in gated communities, some drivers may not feel safe driving at higher speeds on local roads. Nevertheless, driving up to 40 to 45 mph would include a large swath of vehicle usage inside and outside a gated community. In effect, the FUV could displace both PTV miles and a sizable chunk of driving performed with highway capable vehicles. Seating configuration is another potential drawback. The seating in an FUV is one passenger behind the other rather than side by side. Some users may feel this reduces the social aspect while riding in the vehicle, particularly on a golf course. For seasonal usage by vacation home owners, there is often a need to store the vehicle for several months without any usage. This can be an issue or at least require some planning for the current battery powered vehicles. According to Battery University a lithium ion battery should be stored at 40% percent charge if being stored for an extended period. Arcimoto did not answer my question directly on this subject but expect to have a battery pack with a lifetime of “…8-10 years with normal vehicle usage, and still maintain more than 80% of their original charging capacity.” The pack replacement cost is expected to be under $2,500 inclusive of the residual value. The success of the Arcimoto FUV in displacing golf cars, PTVs and LSVs will depend on three key elements: marketing, pricing and local regulations. The last may be the most important. If gated communities object to the FUV’s higher speed capabilities, and there is no technological fix, foreclosing the market. The pricing may be the easiest to address. If Arcimoto can hit their target price at volume production, even without tax incentives there is a compelling cost benefit story for the FUV. The marketing element depends in part on where Arcimoto’s management wants to invest resources. The gated community market may be too small to target during the initial phases of the vehicle’s rollout. In addition, golf car dealers mainly serve this market. The company likely does not have relationships with this distribution channel. On the other hand, their rental franchise plan could overlap with these dealers as some are located in tourist oriented beach communities and have high PTV use. This angle could serve as an entry point to the market. In response to my questions Arcimoto stated that they put on a test ride event for the FUV at The Villages, a gated community in Florida, on November 12th. They also noted that the short drives and warm weather make resort communities a great market for the vehicle. In a years time we will have a better idea whether the Arcimoto FUV has met with success, and whether it threatens the PTV market. This entry was posted in electric vehicles, golf car, low speed vehicle, LSV, Market entrants, market trends, marketing, NEV, Pricing info, Sales figures, scooters & three-wheelers and tagged Arcimoto, Fun Utility Vehicle, FUV, gated community, Oregon, PTV by Marc Cesare. Bookmark the permalink.